Launched in August, 2015 by the Chief Minister then, Anandiben Patel. 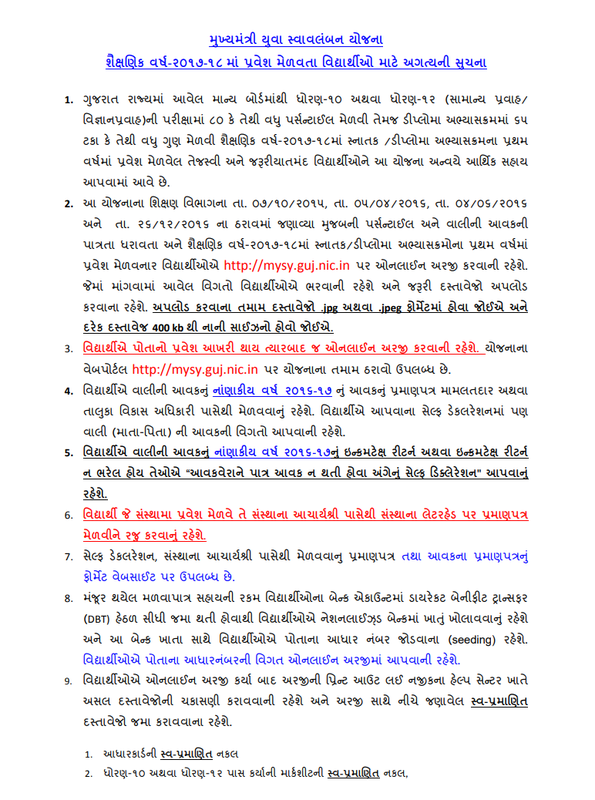 MYSY is the only ‘Scholarship Scheme for Students in Gujarat‘. Announcement of this scheme is made for the young students of Gujarat to provide equal opportunities in higher education and government jobs to all category and casts. Reservation policy for SC/ST/OBC is applicable in the state which covers about 49% seats. Various castes of general category recommended that bright students of the general category should be given equal opportunities for higher education which will be helpful in overall growth of the state. After the detailed study of the recommendation from the people personally through applications and consultation with higher authorities of Gujarat government, the committee headed by Shri Nitin Patel submitted this report to Anandiben Patel. 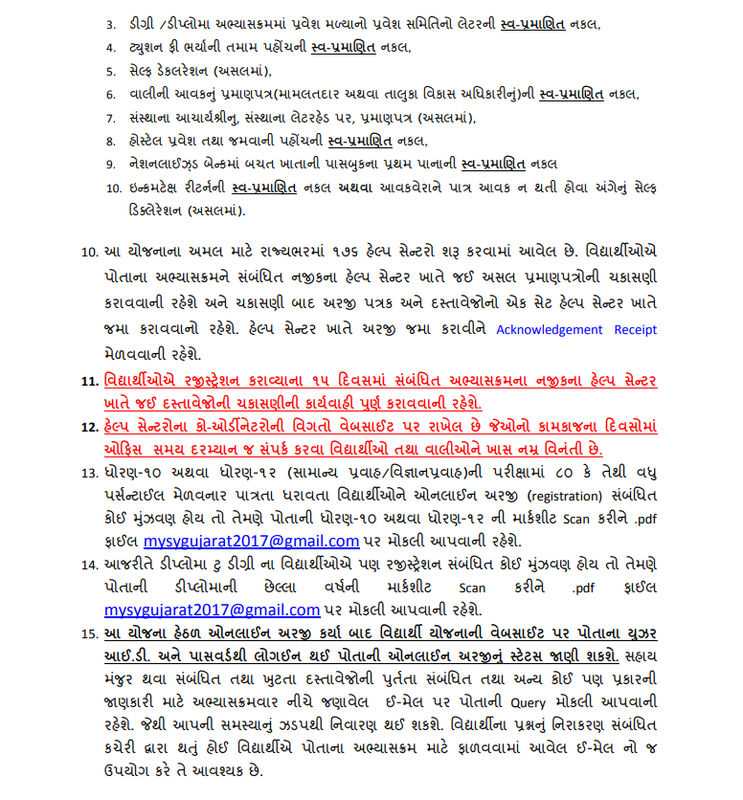 Based on the suggestions and recommendations by the people of Gujarat Chief Minister Anandiben Patel announced the scheme “YUVA SWAWLAMBAN YOJANA” for higher education and she made important changes in rules for governmental jobs in Gujarat state. This scheme was implemented from 2015 and students are benefits on the Merit, rather than caste and gender discrimination. Bright students from Gujarat board and central board, who secured more than 90% in higher secondary exam are eligible to get 50% fees or 2,00,000/- per year maximum. 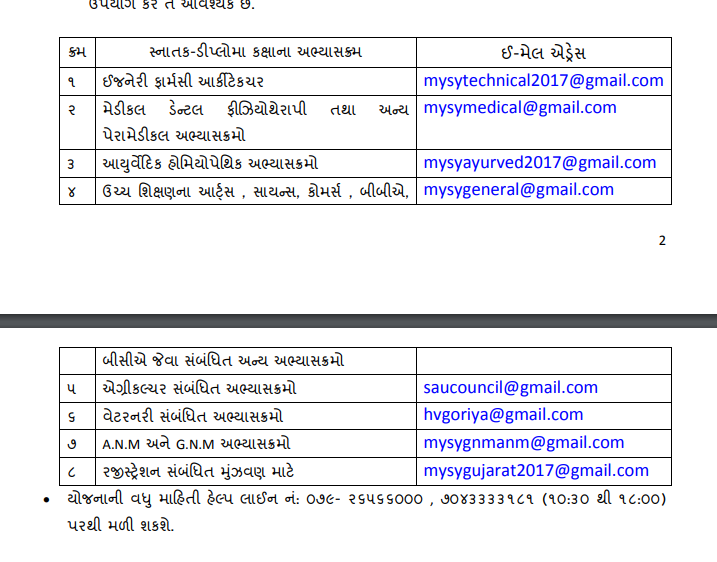 Amount will be given to student in Gujarat Medical Education Research Society (GMERS), dental courses and self-finance institutions. Thus, the government will provide assistance of worth rupees 10,00,000/- during five years. The annual family income limit is set at 4.5 lakhs. In professional courses such as Engineering, pharmacy, Ayurveda, Homoeopathy, Nursing, Physiotherapy etc. the amount considered to pay the student is 50,000/- a year as a governmental assistance as maximum amount for self-finance college. 10th and 12th standard students who opt for diploma courses after securing 80% or more will get 25,000 a year or 50% of fees. Whichever is lesser will be given to the student. In other graduation courses such as B.A., B.com., B.Ed., B.Sc., 50% of the fees or 10,000/- rupees whichever is lesser will be paid as a governmental assistance to the students. Facilities for lodging and food is also available in the scheme where a student will get 1200/- a month for lodging facilities for a period of 10 months. Free textbooks for all secondary and higher secondary government schools. Free cost of uniforms, textbooks and scholarships for the students of all castes in government schools and granted schools. Around 62 Lakh students will get the benefits. Age relaxation is extended by five years in all categories for government jobs. In next five years Sardar Patel Institute for Professional Administration (SPIPA)’s seats will be increased to 1000 from 340. Youth appearing for national competitive exams will be trained at the training centre that will be set up at every district. 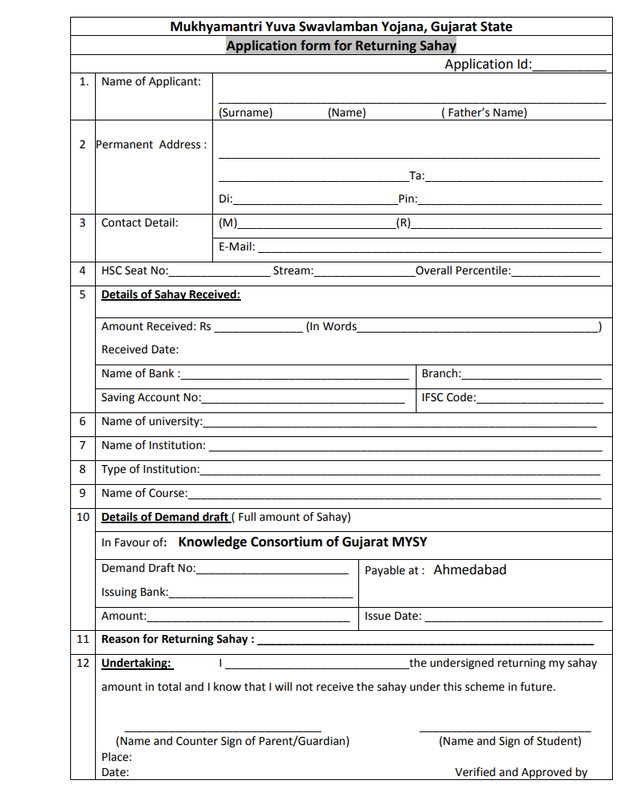 There has been a lot of queries regarding swawlamban yojana form online and students are looking to have the perfect way to save and use their mysy online form. We are here to help each and every applicants to get their details correctly. Each candidates must need to fill all the details mentioned on the below image. Please note that all the information should have been verified and correct. 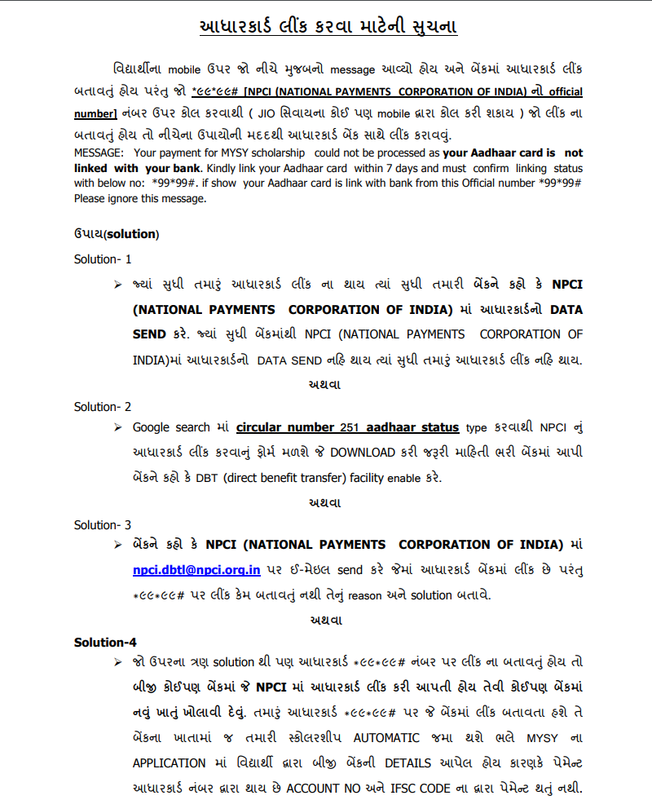 A few documents will be needed to submit online or offline while applying such as domicile certi., caste certi., income certi., passing mark sheet, residential proof, admission proof etc. -After that students needs to click on their respective streams like science or commerce. 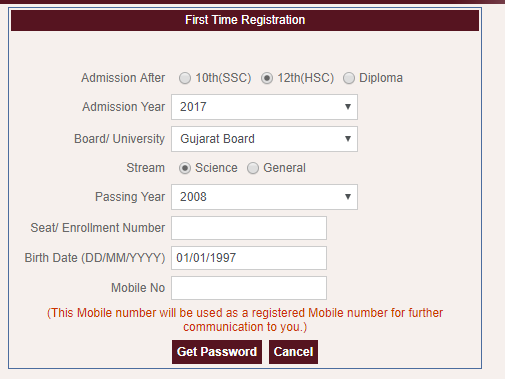 -After than students needs to click on their respective board like gseb or any other applicable. -Finally, they need to click on get students details which lead them complete MYSY Scholarship Information online on their screens.